With every new season comes the perfect opportunity to dress your child up in theme and take thousands of photos. I figured better do it now because in only a few short years, he’ll have a strong opinion about what he wears. Then he’ll be 13 and wearing t-shirts with band names I have never heard of that he hopefully will let me wash once a month or so. These are the things I think of late at night. So after digging through Liam’s closet trying to find something halloween-ish that he could still fit into and was warm enough for 80 degree temperatures, I came up with… nothing. So I decided this was the perfect excuse to make him a halloween themed shirt. This time, however, I put away the fabric pens and store bought cotton t-shirts and decided to come up with something totally from scratch. 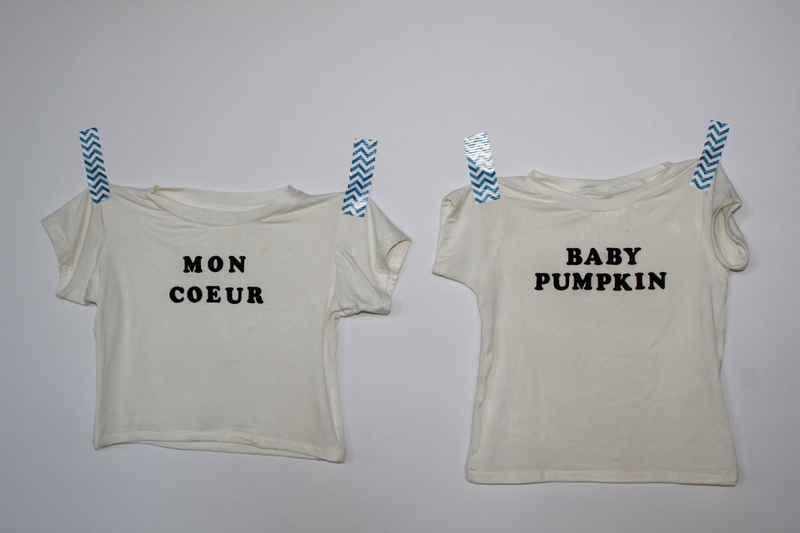 So alas, my baby pumpkin has a new shirt, perfect for a trip to the pumpkin patch. A little back story about why I chose “BABY PUMPKIN” for his shirt: For the past month or so, Liam has started referring to himself as “baby.” I think this started because we called him “baby Liam” for so long and the “baby” part just stuck. So each time I ask him if he wants to get a pumpkin, he will tap his chest and say “baby pumpkin.” I found that like most of his new “tricks,” this was the freakin’ most adorable thing I have ever seen. So baby pumpkin he is. For now, at least! 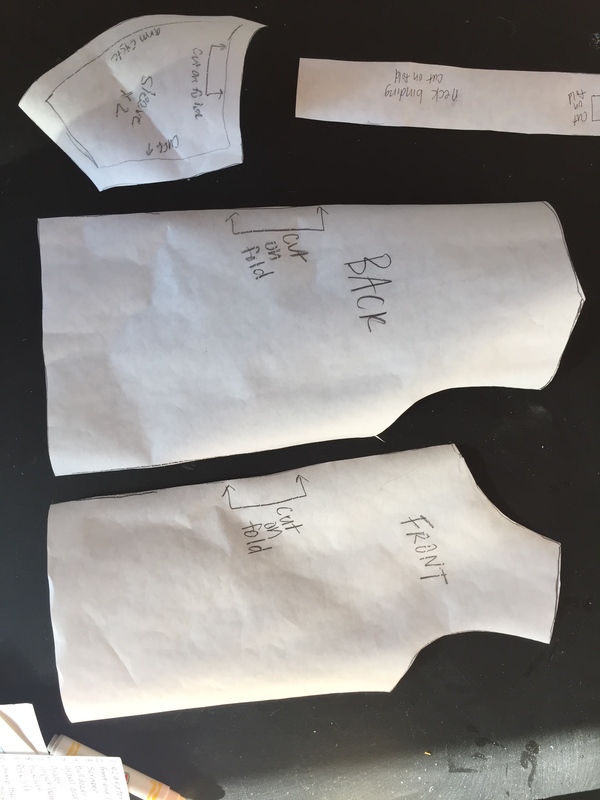 I used one of Liam’s current size 2T shirts to draft a paper pattern. If you are curious how to make a shirt pattern out of one of your old shirts, it’s pretty easy! I like to first draft a pattern on freezer paper so I will be able to make this shirt again and again! Here’s what you need to do. Step one: Lay out your freezer paper. 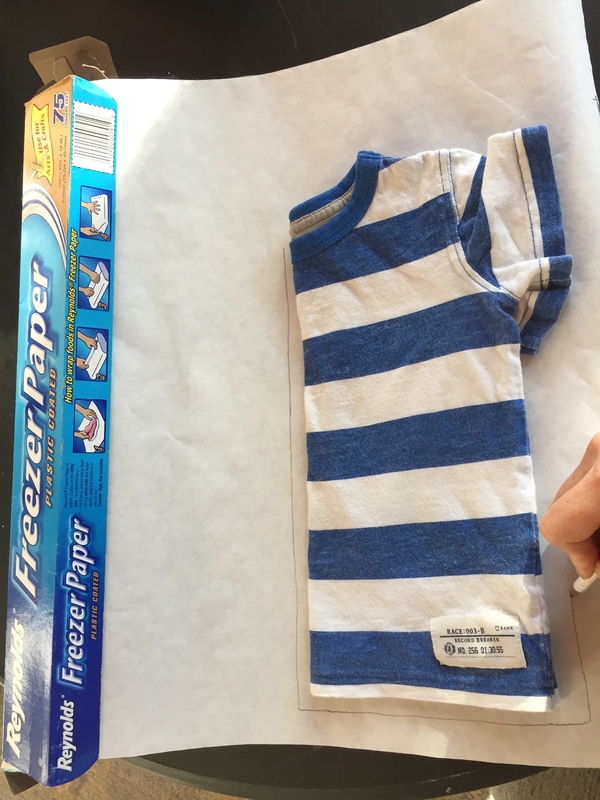 If you don’t have freezer paper, you can use regular computer paper, but you will have to tape several pieces together. I prefer freezer paper because you can iron it directly onto the fabric when its time to cut out the fabric. Step two: Place your shirt folded in half on the paper and mark all the lines of the shirt while adding an extra 1/2 inch for your seam allowance, as seen in the photo below. Step three: Repeat the tracing for the back of the shirt and for the sleeve. Step four: Cut a rectangle strip from your freezer paper to be used as your neckband. To get this measurement, I measured the neck band of Liam’s current shirt but then subtracted a few inches because in order to have the neckband lay nice and flat on the body, you want to have it stretched in place a bit when you are sewing it in. For my 2T shirt, the neck opening measurement was 15 inches but I ended up cutting the neck band piece 10 in x1.5 in. You should now have 4 pieces: a front, a back, a sleeve, and a neckband. Some Tips: When its time to cut your fabric out, don’t forget to cut the front, back, and two sleeves on the fold. By making these pattern pieces “in half,” so to speak, and cutting the fabric on the fold, you are ensuring that both right and left sides will be identical and symmetrical. Now you can sew your fabric! Remember that if you drew an extra 1/2 inch when you traced your shirt, then you need to sew a 1/2 seam allowance. If you drew 5/8in, then sew 5/8in, and so on. I like to sew shoulders first, then add sleeves, then sew the side seams and sleeve seams. Add your neckband, hem the sleeves, hem the bottom, then iron on your letters and you are done with the shirt! Here are two of the shirts I have most recently made Liam. I drafted the Mon Coeur (my heart) shirt from a size 18 month shirt so it is much shorter. Well, he is very cute in his new t shirt. My boys were/are more interested in Zelda and Nintendo t shirts than bands, and they are thrown in the wash regularly. But youre right, he will be a teen before you know it.